This has got to be one of the coolest videos I have come across, what a way to kick start our week. The legend that is - Jam Master Jay legacy surely lives on through his son - TJ Mizell. 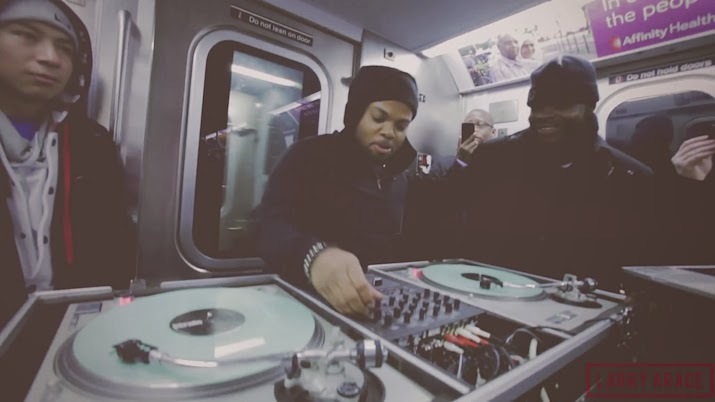 TJ Mizell brings a uniqueness to the New York subway train on his way to Marcy Projects in Brooklyn, where we see him DJ'ing and scratching the ones and twos with his crew playing a Jay Z mix. This video incorporates an end-to-end experience, where TJ Mizell is DJing impromptu on the J train in front of local New Yorkers. The video includes an ultimate hustle of trying to get electricity from a car battery all the way through to carrying the equipment into the subway during rush hour traffic. He crosses the Williamsburg bridge into Brooklyn (Marcy Ave) and finishes the routine, which is a dedication to Jay Z. The music includes a Trap remix of "Tom Ford (Benzi Remix)" and "Show Me What You Got (DJ Green Lantern Remix)". Man, if I was on this train with my sisters - the turn up will be so real. Watch the official video to ‘J Train to Marcy’.